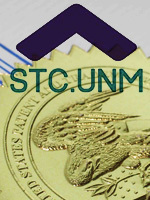 The U.S. Patent & Trademark Office (USPTO) issued eighteen patents to the UNM Science & Technology Corporation (STC) during April, May and June of 2016 for technologies invented at the University of New Mexico. Of this total, six patents name CHTM faculty members. USPTO issued nine patents to STC during July, August and September of 2016 (first quarter of FY 2017). Two of these patents name CHTM faculty as contributors. This brings the six-month total to 27 patents, of which eight include CHTM faculty members as named inventors. Visit the original story at STC.UNM for the complete list of patents and the UNM academic departments whose faculty contributed research. This technology measures both absolute and relative attitude of a vehicle using an intra-cavity phase interferometer (IPI) method and an active bidirectional mode-locked laser that measures all three attitude rotation vectors (“pitch”, “yawn”, and “row”) and measures the vehicle’s position relative to earth using information from its local magnetic field. Applications: satellites and satellite navigation, space crafts, acceleration detection, optical-based guidance, and guidance, navigation and control systems (GNC systems). This technology introduces a new technique for low-power photonic control of RF resonance in which bulk illumination of silicon in the 1000-1100 nm range is used to control the resonant field of a microwave ring resonator. Using this technique, the transmitted RF power through a microstripline-ring filter fabricated on a junction-less silicon substrate can be changed with record low power. This technology is a new focal plane array (FPA) architecture that redefines key components of a conventional FPA and uses three-dimensional wafer processing techniques to achieve certain design goals. This new FPA architecture has a longer thermal cycle lifetime and very thin semiconductor contact layers. In addition, this process enables the design and fabrication of new, highly advanced FPAs. This technology is currently optioned/licensed. This technology is a novel, non-traditional ionization-aware dynamic biasing scheme called Dynamic-Bias Enhanced Avalanche Photodiodes (DBE-APD). It enables APDs to meet the high bit-rate demands of the changing telecommunications industry to be suitable for digital 40-Gbps fiber-optic communication links. Applications: fiber optic communication/high-speed optical communication, space (optical) communication, distance measurement, data transmission, range finding, high-speed industrial inspection, various medical and electronic devices, imaging using APD arrays (focal plane arrays with APD detector elements). This technology is a novel method of increasing sensitivity in ring laser devices. The method relies on the non-linear sagnac effect (NLSE) and maintains ring size. With this method, the sensitivity slope has an approximate increase of 100-1000 over current methods. Applications: homeland security, navigation systems, and semiconductor devices. This technology is a novel process for producing a 2D array of germanium (Ge) quantum dots on silicon-germanium (SiGe) substrates. The process involves reusable technology that has the potential to offer transformative cost-reductions in fabricating a well-defined 2D array of nanostructures. Ge growth is steered in a well-defined nanoscale 2D array with no dislocations and a high degree of uniformity across large areas. Applications: in sensors, data storage, and quantum computing. This technology expands upon the use of chirped grating systems to make high-power, optically-pumped, tunable mid-IR lasers. Chirped gratings are fabricated on the top surfaces of the target substrate, in a longitudinal orientation by translating the pump region up and down to tune the appropriate wavelengths that will be reflected/transmitted. This form of grating uses interferometric lithography for tuning over a wider spectrum. The technology is based on identifying joint spatial and spectral features through statistical analysis. The ASRC algorithm fuses thematic classification with spectral edge detection, thus the edge detection threshold process is adaptively changed depending on the spatial diversity of the materials within the imaged scene.